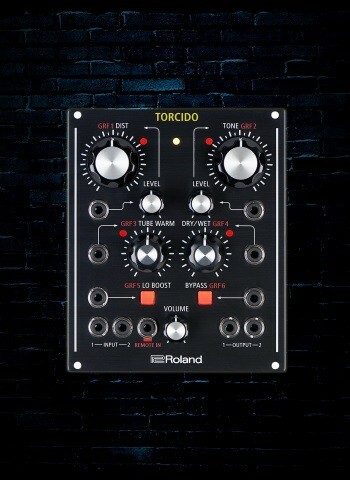 TORCIDO can produce tones ranging from gentle, warm overdrive to heavy distortion. Using the large, high-resolution knobs, or standard 1/8" patch cables, you can independently control the distortion amount, tone, tube warmth, wet/dry signal, low-end boost and signal bypass. Both the distortion amount and tone parameters have input level controls for adjusting the modulation range when controlled from an external source. Two inputs and two outputs make TORCIDO a stereo-capable, 24bit/96kHz audio interface for Eurorack systems and the built-in AIRA Link USB compatibility gives it single-cable, plug and play connectivity with the MX-1 Mix Performer.